Kapila Silva, Ph.D., is an Assistant Professor at the University of Kansas. Dr. Silva’s work focuses on the role architecture plays in global heritage, with a particular emphasis on historic preservation in non-western cultures. 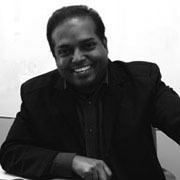 He has written two books on Sri Lankan architecture and co-edited another on Asian Heritage Management and is an internationally recognized leader in the area of World Heritage Site research. Due to the increasingly harsh impacts of climate change, his work has increasingly addressed the impact of disaster on the meaning of architecture and this has informed his more recent professional practice in South Asia. Dr. Silva’s research has significant international implications rooted in robust theorization but with an eternal focus on eventual applicability. For these reasons, Kapila Silva is recognized with ARCC’s 2013-2014 New Researcher Award.